I think it's pretty safe to say that I'm a nerd when it comes to books, especially when it comes to certain series. Out of everyone in my social circle, I'm like 99% sure I'm alone in the fact that I've read all the Game of Thrones books (or as they're properly called, the A Song of Ice & Fire series), multiple times, plus watched all the seasons of the show and now I'm beginning to work my way through the ASOIAF novellas, such as The Ice Dragon and now A Knight of the Seven Kingdoms. 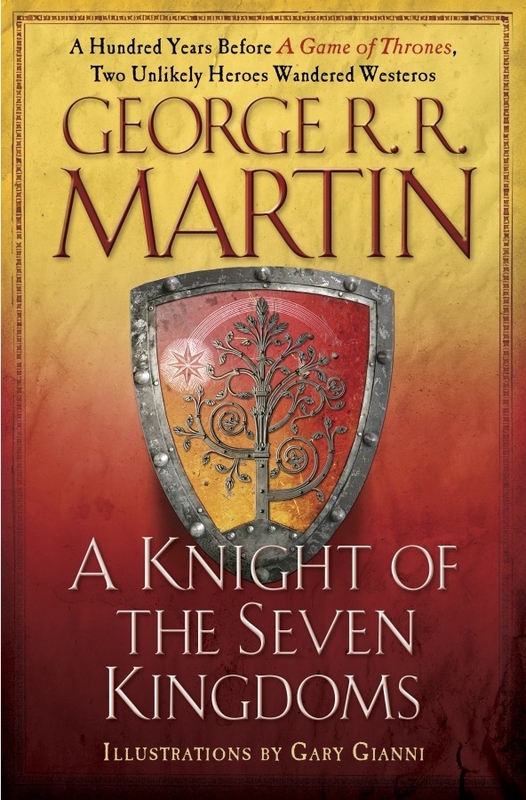 Taking place a hundred years before the events of Game of Thrones, A Knight of the Seven Kingdoms follows the tale of Dunk the Hedge Knight and Egg his squire, who later become the legendary Ser Duncan the Tall and King Aegon the Unlikely and Daenerys' great-grandfather. You may also recall that Egg is the brother of Maester Aemon of the Night's Watch! 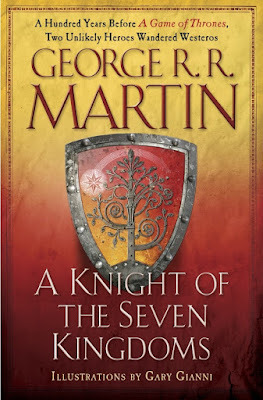 A Knight of the Seven Kingdoms consists of three previously published novellas that depict the beginnings of this unlikely pair's adventures. In the beginning, Duncan, or Dunk, is a the unlikeliest of heroes. As a hedge knight, he has barely anything to his name, including his knightly name. Desperate to make his mark, he enters a tourney, where he stumbles across Egg, a bald stableboy who, for whatever reason, decides to latch onto him. Unbeknownst to both, this tourney has some pretty aristocratic attendees, including several Targaryen princes, and wherever the three-headed dragon goes, drama and destiny is soon to follow. At the end of the tourney, several lords and a prince die, while a new knight arises - and this is just in the first part of the book! A Knight of the Seven Kingdoms is not a prequel by any means, but is a fun and easy-to-read peek into the rich past of Westeros. The one thing I really love about George R. R. Martin's writing is just how layered he makes his characters' history and how deftly he ties the actions of the past to the present. In the time of A Knight of the Seven Kingdoms, the Targaryen dynasty is securely in place, and although there's been a recent insurrection by a Targaryen offshoot, times are pretty rosy compared to the Westeros of ASOIAF. I love the haughtiness of the Targaryen house and there's just something so nostalgic about reading about them in their full power, spouting "blood and fire" everywhere, while knowing how far they will soon fall. The only thing missing from this book are the Starks, as much of the book takes place in the South. One can only hope that maybe in the future George R. R. Martin (I don't know why I have to refer to him only by his full name) will write more about Duncan and Egg's travels. One thing is for sure: this has only made me all the more hungry to read more stories about Westero's rich past!